In Part 1 of ‘The Psychology of Buying a Squash Racket’, we looked at the internal factors which influence us to make buying decisions. Our personal perception, knowledge, attitude, personality, lifestyle, motivation and the roles we play in our lives all affect the way we buy. Marketers know this and are experts in finding out just how potential buyers live their lives so that they can work out what kind of products to develop. But apart from internal factors, there are external factors which influence our decision-making. Factors which are outside our control but which directly or indirectly affect our lifestyles and what we consume. There’s also a well-known process that all buyers follow in making purchases. And, not only that, there’s a typical feeling that some buyers experience after they’ve made a certain kind of purchase. Culture is made up of inter-woven sets of shared values, attitudes, goals and practices which we learn by observing or interacting with other members of society. It also incorporates shared behaviours and actions based upon what is a uniquely human capacity for symbolic thought. In other words our capacity for associating strongly with stories, iconic objects and other cultural references. In the context of squash, it’s easy to see squash balls and squash rackets as iconic objects forming an integral part of squash culture, much of which is passed on from one member of the broader squash community to another. But culture is a broad concept which, to marketers, is less important as understanding what happens within smaller communities or sub-cultures. Sub-cultures also have shared values but within smaller communities such as those influenced by age, ethnicity, gender, religious belief, geographical location or special interests. Think of women squash players, juniors, veterans, coaches and so on. So, as part of their efforts to convince customers to buy their products, marketers often use cultural references, especially in targeted promotional appeals. The idea is to connect to consumers using cultural references that they will instantly recognise and embrace. By doing so, the marketer hopes that the consumer will feel more comfortable with the product or relate to it better as it corresponds with their cultural values. Smart marketers also use culturally-informed research methods to try and identify differences in how sub-cultures behave. This helps them to identify changes in behaviour which they can then respond to by changing their marketing tactics, for example by developing new products, making new offers or opening new sales channels. Characterising the groups consumers belong to also helps marketers to identify target markets, develop new products, and create appealing marketing promotions to which consumers can relate. In particular, marketers try to identify group leaders and others to whom group members look for advice or guidance. These people, if well-respected by other group members, can often be used to provide an insight into group behaviour; and, by accepting promotional opportunities, they can act as effective spokes-persons for the marketer’s products. So, not surprisingly, professional squash players are often sought out by marketers to lend their image and endorsement to certain (usually expensive) squash rackets. The third external factor affecting purchase decisions is circumstance. In other words, the situations people find themselves in when making decisions. Situations may arise from a variety of personal circumstances such as someone’s physical environment, their emotional state, or even time constraints. And some situations are uncontrollable, in which case a consumer may not stick to their normal approach to making a purchase decision. For example, if someone needs a new squash racket quickly and their local retailer doesn’t carry the brand they usually purchase, they may choose to buy a competitor’s product. Marketers typically try to take advantage of decisions made in uncontrollable situations in at least one of two ways. First, they can use promotional methods to reinforce a specific selection of products, perhaps by promising to service an item free of charge if the user accidentally damages it. This incentivises the buyer to use the purchased item rather than just keep it as a spare. Second, marketers can try to convince consumers that a situation is less likely to occur if their product is used. In the case of a squash racket, this may be by claiming that particular materials used to make it are well in advance of those used to make other rackets, making it (almost) indestructible and imbued with magical properties. So, having thrashed every last ounce out of the factors that influence our buying decisions, what about the buying process itself? Just how do we buy? 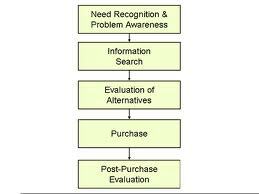 Well, researchers have identified five purchase decision steps although whether a consumer will actually carry out every step depends on the type of purchase decision they face. In cases of routine, brand loyal purchases, for example, consumers may skip several steps in the purchasing process because they know exactly what they want; it may take them little or no time to come to a decision. For more complex decisions, however, such as those associated with major new purchases, the purchasing process may take days, weeks, months or even longer. So, in considering the five purchase decision steps, marketers know that, depending on the circumstances surrounding the purchase, the importance of each step may vary. Even though they may not know exactly how. In Step 1, the consumer feels that, for some reason, they are not satisfied with their current situation (their perceived actual condition) and wants to improve it; in other words, they want to achieve their perceived desired condition. With me so far? So internal triggers, such as the dissatisfaction which some players may feel after a run of lost squash matches, may cause them to believe that a new squash racket is needed. External factors can also trigger a consumer’s needs. Marketers are particularly good at exploiting opportunities arising at this stage of the decision-making process through advertising; through features in squash magazines or on squash websites, or using displays at squash events or in sports retail outlets. At this stage the may stall if the consumer is not motivated to continue – and we looked at what motivates people to buy in Part One of this article. However, if they do have the internal drive to satisfy their need they will continue to the next step in the process. Motivated consumers will next look for information about possible purchases. To get the information they need, they may simply recall information from their past experience (memory), ask other people about their past experiences (always entertaining), or expend considerable effort to access information contained in outside sources such as advertisements, articles and videos. How much effort a consumer will choose to expend on searching typically depends on such factors as: the importance of satisfying their need; their familiarity with the options available to them; and the amount of time they are prepared to spend on their search. To appeal to buyers at the search stage, marketers generally make efforts to ensure that they can easily locate information related to their products. So, for marketers whose customers rely solely on the internet as a source of useful information, attaining high rankings on internet search engines is a critical part of their marketing strategies. Consumers’ search efforts may – or may not – result in a set of options which they can assess before making a choice. At this stage, a consumer may create a set of possible solutions to their needs simply in terms of product type or, additionally, in terms of the brands on offer for each product type. So, for an adult male wanting a new squash racket, a choice of brands will typically be available, each of which will provide a further range of options relating to racket head shape, stringing, weight and balance, grip, colour and accompanying promotional storyline. So, marketers need to understand how consumers evaluate product options and why some products are selected to choose from whereas others are not. Most importantly, marketers need to discover which criteria consumers are using to select of possible options and how each criterion is being evaluated. Marketing tactics tend be most effective when the marketer can target their efforts based on accurate knowledge of which benefits are most valued by consumers when selecting purchase options and what is the relative order of importance of each benefit. In many cases, the product chosen by a consumer is the same as that which they have evaluated as being the most suited to their needs. However, this may change when it is actually time to make the purchase. In other words, the intended purchase may be subject to alteration at the time of purchase. 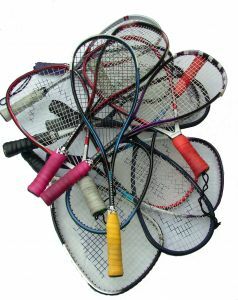 The product may be out-of-stock or have been discontinued, often a common situation with squash rackets as product lines are regularly changed. A retailer may offer an incentive at the point of purchase, for example by mentioning a competitor’s offer. A consumer may not have the money they need, or may be adversely influenced by members of their reference group who take a negative view of their proposed purchase. For their part, current market leaders in particular have to make sure that purchase transactions go as smoothly as possible. Internet retailers in particular have tried to streamline their online shopping cart and checkout processes to reduce the likelihood of consumers abandoning their purchases before completion. Marketers whose products are not currently amongst the consumer’s first choice, may offer last chance marketing incentives, such as getting in-store salespersons to “talk up” their products at the checkout line. Surprisingly perhaps, the buying process isn’t over even after a purchase has been made. The consumer is still faced with an evaluation of their decision. If a product performs markedly below a consumer’s expectations, then they will tend to re-evaluate their decision to buy it. If they are dissatisfied with their original decision, they may even want to return the product. In less extreme cases, they may still retain the item but hold a negative view of the product, making it less likely that they will purchase a similar product from the same marketer in future. This feeling of dissatisfaction even has a name – buyer’s remorse – and is particularly likely to occur in situations where the buyer regards their purchase as expensive or highly important. 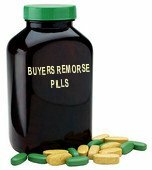 Buyer’s remorse is thought to stem from a fear of making the wrong choice, from feelings of guilt about being extravagant, or from a suspicion of having been exploited by a salesperson. The anxiety which characterises buyer’s remorse may be rooted in various factors, such as the consumer’s concern they may have purchased the wrong product, or even the right product but at too high a price. Other concerns may arise from: the purchase of a current model now rather than waiting for a newer model; purchases made in an ethically unsound way; purchases made using credit or a loan that will be difficult to repay; or even the purchase of an item which may be unacceptable to others, such as fellow members of a reference group. Before the buying process starts, a prospective buyer will often feel positive emotions towards their future purchase, including desire, a sense of heightened possibility, and an anticipation of the enjoyment that will accompany the use of the product. Having made their purchase, however, they are more likely to experience negative aspects such as worry that other people may later question their purchase or claim to know better alternatives. Where evidence exists that it is justified, buyer’s remorse is a classical example of what psychologists call cognitive dissonance. One will either seek to discount the new evidence, or to experience true regret – and try to renounce the purchase. And you thought you were making a simple choice about which squash racket to buy, didn’t you?